After wrapping up our time in Ecuador, I will continue writing blogs. It could be, however, that I do this from a different website or blogsite (because it will not be about Ecuador anymore). If you would like to stay informed and would like to keep reading the blog, you can subscibe below. You will then automatically receive each new blog in your email. The time right before a planned event is always very strange (in my life at least). I have never been very good with these times. I would try to ignore 'the planned event' till the last moment. For instance with an exam; I would ignore it completely and then get up at 4 am of the day of the exam, to study (how did that work out for me? In highschool; fine, but when I had to seriously study for my midwifery exams; not so well. Far too much information). With moving the same; I used to try and live comfortably and having to do everthing last minute. Eric is almost the opposite. He would almost prefer to sit in a bare house, everything packed, weeks before. No plate to eat from? Oh well; at least everything is organised. He wants to almost buy a car already in Madrid, when we're not even there yet. We have very different coping mechanisms. And they interfere with each other, as you can imagine. Yesterday, for instance, Eric had divised the plan that we would already pack as much as possible, so that we wouldn't have to do it last minute. And I am struggling with that, because I want to ignore and be comfortable as long as possible (When leaving on Sunday, Saturday evening is early enough, isn't it?). I call it coping mechanisms, because I am sure that we actually both fear change. We just handle it differently. And both approaches don't work a 100% well. They have worked well for me as an individual (sometimes) and for Eric as an individual (also sometimes I suppose? ), but as a couple (with kids as well)...no. Eric's way is very organised of course, but too controlled. My way is undoable when you have to move a whole household, although you might feel -sort of- relaxed untill you come to the undoable part. I try to bring down Eric's control over things, while he tries to push me to organise more. Yesterday- Thursday- was a weird day anyway. I woke up at 3.30 am and felt too clear in my head to fall asleep again, but at the same time exhausted and with a headache. Eventually I fell asleep around 5 am and slept till 8 am. I woke up with a bit of sick feeling in my body. My eyelids were sticking together as if I had an eye infection and I still had the headache. But this was the day we were going to start packing our suitcases to see if it would all fit. I dragged myself through this ordeal, with a lot of grumpyness and not agreeing. And Eric, seeing my mood, trying to not react too angry at me and at the same time trying to take me seriously (he had years of practice). I was very unfriendly to everyone and wondered what was going on with me. What adds to days like these, is that I really don't feel like doing anything benificial for myself (why eat an apple when you can eat chocolate, right? ); Like meditating or going for a walk. I turn down anything that could lift me up. Why is it so nice sometimes to just wallow? After 4pm I started feeling better, after an online chat with Nikki. I wrote to her that I was in a bad mood and was very unfiendly and unloving to everyone that whole day already. She wrote that she loved me anyway, even if I didn't love her. And somehow she got me there. Just that sentence kept sticking. Especially knowing from how far both of us had had to come, to really open up to each other this way. And to make the step to admit we love each other...that was quite a step some weeks back. So it felt a bit like a responsibility for me to meet her unconditional-ness somehow. I decided to meditate and off course started feeling better instantly. It is funny how it works between Eric and me. We subconsciously seem to 'test' each other (like; are you really feeling better? Let's see!) ; as soon as my spirit was improving, he accidently hurt me- or maybe I hurt myself in a way (my hair got caught in his watch). My uplifting was still very fragile, so I felt down instantly again and started moping again. But I could also pick myself up very quickly after; I had somehow broken the hold of the 'feeling sorry for myself'-thing in the meditation. The day ended at 21.30 with an earthquake. The strongest one we ever felt. It had a 6.6 magnitude and was only 60 km's away. We were sitting on the couch, Mar, Eric and me, watching 'Anne with an e' (which Mar simultaneously loves and hates; it is so recognizable the embarrasing situations you can go through when you are a teenager) to close off the day. It felt like the earth below us started dancing in slow waves. We looked at each other and after about 10 seconds I was like; maybe we should go outside? A bit late, because if it would have become dangerous, we would have been too late. But anyway. Outside we met the neighbours (who also went outside) and heard dogs howling everywhere. For hours we felt aftershocks. The earthquake itsself seemed to last for ever. I found it a very fitting end to a difficult day. 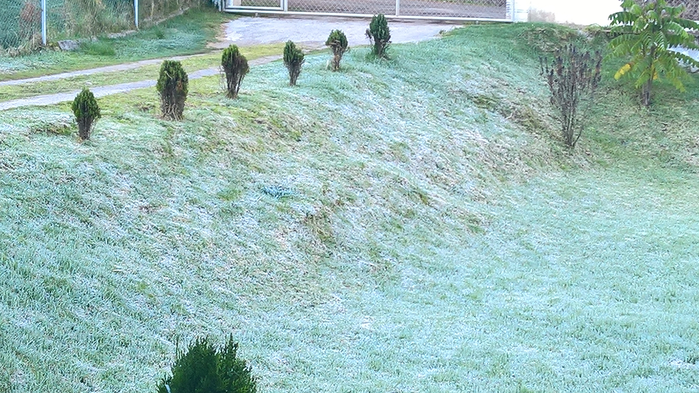 The night following was icy cold and in the morning we woke up with frost over the grass. As the Netherlands has been too warm, Cuenca has been 10 degrees to cold for months now. Maybe the Inuit-elders are right and there is no climate change but the earth just shifted a bit into a different wobble. Which might mean that Scandinavia and Northern Europe become tropical, while South America becomes colder? 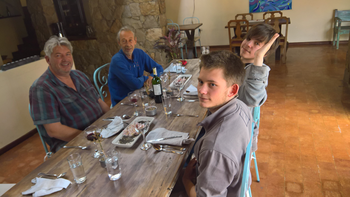 Today we said goodbye to our Archery teacher from Vilcabamba, who came to Cuenca to have lunch with us at a very special lunch place; A Japanese guy, a chef cook, makes 6-course meals in his own house. Very special meals, which he spends days preparing for. People can write themselves down for a meal, by sending an email. They receive the menu on the Monday of the week they booked. It was delicious, very special, very refined. Tomorrow afternoon we will cook for the last time -here- and after this bring our pots and pans and other things over to the house of the neighbours. On Sundaymorning a big cab comes to pick us and our 15 suitcases up, to bring us to Quito. In the morning we will still have to bring our mattresses, blankets and fridge over to the neighbours. And then we are off. After the coming week in Quito we will fly to Madrid (with a stop at Bogota-bugger). At Madrid airport Nikki and JF will be to pick us up and take us to Granada. And after that? No idea.